Collection of Free Tools All at One Junction! 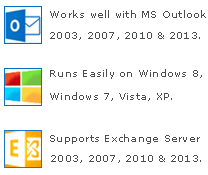 Are you looking for free conversion, free recovery and free management of Exchange EDB file, Outlook PST and OST files. Then you are the right place as now users can catch all Exchange Freeware and Outlook Freeware just in one place. Download free all software freeware trial versions of related tools. Freeware versions are kept for users sake. Click on the software specific button to know how well the software works.